Dr. Goosey has come to understand that many patients think that a cataract is a kind of cloudy film that forms over your eye. But, in fact, a cataract is a clouding of the naturally clear crystalline lens inside the eye. It is the leading cause of blindness and is conventionally treated with a surgical procedure called Phacoemulsification. The human eye is a lot like a camera. To work properly, it needs a clear lens to focus light on the retina. A loss in vision occurs because opacification of the lens obstructs light from passing and being focused on the retina, at the back of the eye. Cataracts are most commonly caused by natural aging of the eye, but there are a multitude of other causes as well. As we age, yellow-brown pigment is deposited within the lens and this, together with disruption of the normal architecture of the lens fibers, leads to reduced transmission of light, which in return leads to vision problems. People with cataracts can experience difficulty in appreciating colors and changes in contrast, driving, reading, recognizing faces, and coping with glare from bright lights. Without cataract surgery, as your vision declines, you’re likely to reduce your day-to-day activities. These changes can impact your health by restricting the things you do and decreasing your ability to enjoy life. But cataract surgery may help prevent these quality-of-life changes. 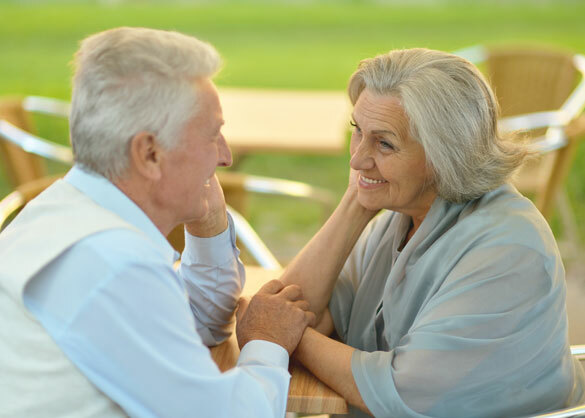 If your cataracts are making it difficult for you to participate in normal activities – such as reading, working, driving, and other task that are important to you, then it may be time for you to consider cataract surgery. Cataract surgery has been shown to reduce stress and anxiety and decrease risk of falling and getting into car accidents. Successful cataract surgery can also make it easier to read, increase social activity and improve overall quality of life. 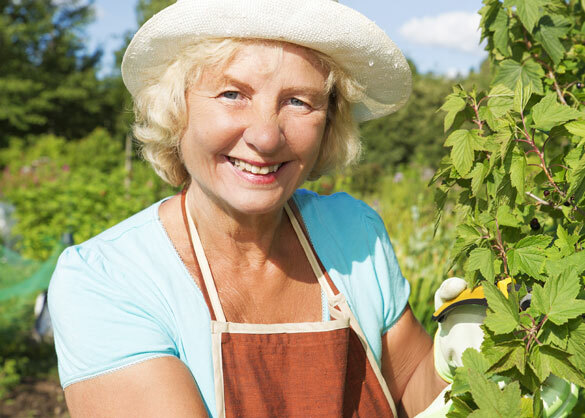 Cataracts may be partial or complete, stationary, or progressive, hard or soft. The main types of age-related cataracts are nuclear sclerosis, cortical, and posterior subcapsular. NUCLEAR SCLEROSIS CATARACT: Is the most common type of cataract and involves the central or “nuclear” part of the lens. Over time, this becomes hard or “sclerotic” due to condensation of the nucleus and deposition of brown pigment within the lens. In advanced stages, it is called a brunescent cataract. This type of cataract can present with a shift to nearsightedness and cause problems with distance vision, while reading vision is much less affected. CORTICAL CATARACT: Are due to opacification of the lens cortex (outer layer). They occur when changes in the water content of the periphery of the lens causes fissuring. When these cataracts are viewed through an ophthalmoscope, or other magnification system, the appearance is similar to white spokes of a wheel pointing inward. Symptoms often include problems with glare and light scatter at night. POSTERIOR SUBCAPSULAR CATARACT: Are cloudy at the back of the lens adjacent to the capsule (or bag) in which the lens sits. Because light becomes more focused toward the back of the lens, they can cause disproportionate symptoms for their size. A mature cataract is one in which all of the lens protein is opaque, while the immature cataract has some transparent protein. In the hypermature cataract, also known as a Morgagnian cataract, the lens proteins have become liquid. CONGENITAL CATARACTS: Which may be detected in adults, has a different classification, and includes lamellar, polar, and sutural cataract. Cataracts can be classified by using Lens Opacities Classification System III. In this system, cataracts are classified based on type as nuclear, cortical, and posterior. The cataracts are further classified based on severity on a scale from 1 to 5. Research had demonstrated that the LOCS III system is highly reproducible. Risk factors such as UV-B exposure and smoking can be addressed, but are unlikely to make a significant impact on vision function. Although there has been no medically proven means of preventing cataracts, wearing polarized sunglasses with UV protection, may slow the development. It had been theorized that the regular intake of antioxidants (such as vitamin A, C, & E) would protect against the risk of cataracts, clinical trials have shown that the use of a supplement has zero effect on cataract development. Once cataracts form in the lens, surgery is commonly performed to remove them. Then an intraocular lens (IOL) is used to replace the cataract lens in the eyes to restore vision. Today, advancements in technology have made it possible for patients to receive multifocal lenses that can take patients out of having to ever wear glasses again. AGE: Age is the most common cause. Lens proteins denature and degrade over time and this process is accelerated by diseases such as diabetes and hypertension. With the passage of time, environmental factors including toxins, radiation, and UV light have an accumulative effect. These effects are worsened by the loss of protective and restorative mechanisms due to alterations in gene expression and chemical processes within the eye. TRAUMA: Blunt trauma causes swelling, thickening and whitening of the lens fibers. While the swelling normally resolves with time, the white color may remain. In severe blunt trauma, or injuries which penetrate the eye, the capsule where the lens sits can be damaged. This allows water from other parts of the eye to rapidly enter the lens, leading to swelling and the whitening, obstructing light from reaching the retina at the back of the eye. RADIATION: Ultraviolet light, specifically UV-B, has been shown to cause cataracts and there is some evidence that sunglasses worn at an early age, may slow cataract development later in life. It has also been recognized, from animal, and epidemiological studies in humans, that microwaves can cause cataracts. GENETICS: The genetic component is strong in the development of cataracts, most commonly through mechanisms that protect and maintain the lens. The presence of cataracts in childhood or early in life, can occasionally be due to a particular syndrome. SKIN DISEASES: The skin and the lens have the same embryological origin and can be affected by similar diseases. Those patients with Atopic Dermatitis and Eczema will occasionally develop shield ulcers cataracts. Ichthyosis is an autosomal recessive disorder associated with cuneiform cataracts and nuclear sclerosis. Basal-cell nevus and Pemphigus have similar associations. DRUG USE: Cigarette smoking has been shown to lead to a two-fold increase in the rate of nuclear sclerotic cataracts and a tree-fold increase in posterior subcapsular cataracts. There is conflicting evidence over the effect of alcohol. Some surveys have shown a link but others that have followed patients over time have not. MEDICATIONS: Some drugs, such as corticosteroids, can induce cataract development. It is unlikely antipsychotics have any effect. However, miotics and triparanol may also increase the risk. Worldwide, more people suffer from cataracts than from glaucoma, macular degeneration, and diabetic retinopathy – combined. Age related cataracts are responsible for 51% of the world’s blindness, about 20 million people. By age 65, over 90% of us will develop cataracts. Approximately 50% of Americans between the ages of 75 to 85, have some vision loss due to cataracts. Today, over 22 million Americans (age 40 and older) have cataracts. By the year 2020, as the U.S. population ages, more than 30 million of us will develop cataracts. Though highly treatable, cataracts remain the leading cause of vision loss and blindness throughout the world. If you know someone who may be experiencing vision problems due to cataracts, don’t wait, seek help right away. Contact Dr. Goosey’s office to schedule an appointment at 281-407-9062. 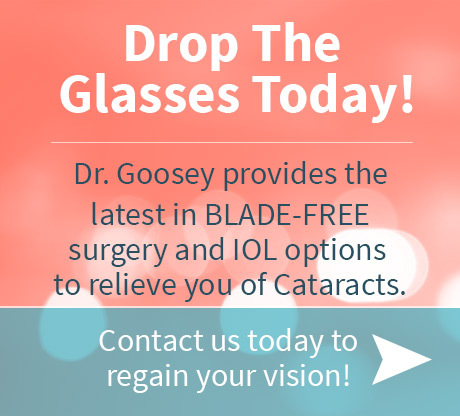 Learn more about the innovative Cataract Surgery Technology that Dr. Goosey uses!